St. Paul is marching towards a $15 minimum wage. 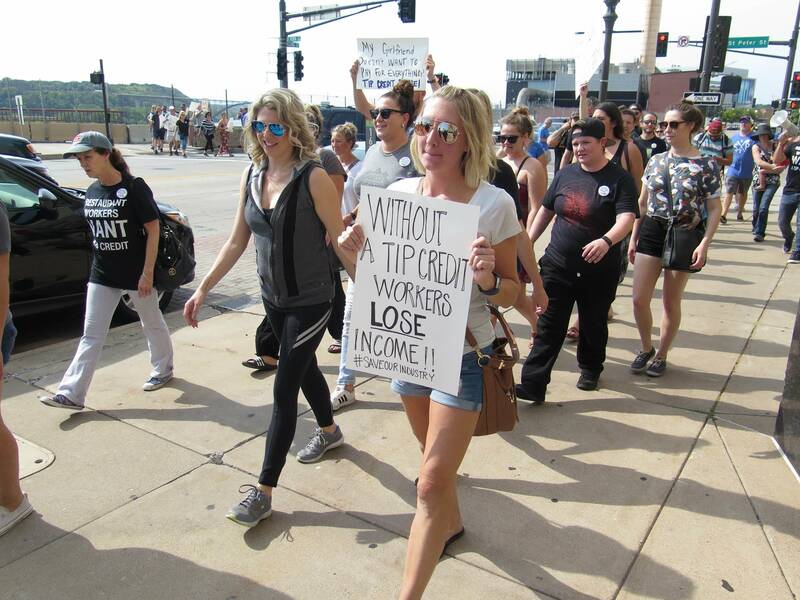 Like Minneapolis, St. Paul plans to raise the wage incrementally and the city council asked the Citizens League to conduct a study about the best way to go about it. St. Paul Chamber of Commerce president B. Kyle was part of that study. "Employers want to participate in this because at the end of the day, they need to hire enough people," she told MPR News Host Kerri Miller on Thursday. Kyle and Ben Spielberg, formerly of the Center on Budget and Policy Priorities, talked about the best way to increase the minimum wage for St. Paul, what city business owners are concerned about and how other cities are fairing with a minimum wage increase. Spielberg told Miller that the living wage in Ramsey County for a single adult is $34,365 a year, which breaks down to more than $15 an hour. "And that's today, if you go to $15 an hour in 2024, that's more like $40,000 because of inflation," Spielberg said. Spielberg also pointed out that you're most likely to see a middle-aged woman making a minimum wage who is the primary breadwinner for the family, not a younger employee. Kyle said it isn't a matter of if they pay $15 an hour, it's how the ordinance is implemented. "I'm here to make sure we're being thoughtful in implementing what the city has asked that we do," said Kyle. The Citizens League study concluded that an increase in the minimum wage impacted businesses differently depending on their size and that implementation and enforcement are crucial in ensuring "the viability of and adherence to a new minimum wage ordinance." They also proposed three different routes the city council could take with the ordinance. B. Kyle is the president of the St. Paul Chamber of Commerce. Ben Spielberg is a former research associate at the Center on Budget and Policy Priorities. He's the co-founder of 34justice.com.